Welcome to Roxy's Ragdoll Kittens! 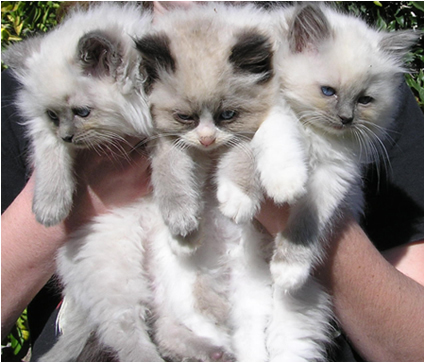 We are a breeder of Ragdoll kittens within California's Central Coast. Roxy's Ragdoll kittens started as a family business in 2004. My daughters and I now only carry TICA (The International Cat Association) Registered kittens. We have enjoyed and learned so much together with our years of breeding experience. If you're looking for a Ragdoll kitten; or just a large, loving, laid-back longhair with blue eyes, then poke around our website. We usually have new Ragdoll kitten litters every six months. Our kittens sell quickly. If we sell out, keep checking in with us or you can ask to be on Roxy's mailing list by contacting us by clicking here. The adoption price of the cats (as of Jan. 2015) is a total of $1200. This fee includes the vet check and first shots. This website gives detailed instructions on how to buy Ragdoll kittens, care for them, and even a littlle information about the Ragdoll breed. 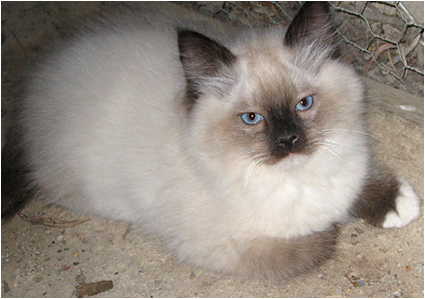 All of our latest Ragdoll kitten litters are posted here. We're a small breeder, so we can make sure that our kittens get the best love and care before you take them home as part of your family. Or, if you're just someone who likes looking at the cutest kittens on earth, then browse our web pages. We tried to put cute Ragdoll pictures on most of the pages.